Diddy Kong Racing DS is a racing game for the Nintendo DS. It is a remake of the Nintendo 64 game, Diddy Kong Racing. Diddy Kong Racing DS was Rare's first Nintendo DS game. This game adds Nintendo Wi-Fi Connection for the multiplayer purposes. Due to Rare's acquisition by Microsoft, Banjo and Conker were replaced by Dixie Kong and Tiny Kong, although Tiptup was kept in the game, despite his appearances in several Banjo-Kazooie games. While developed by Rare, the original game is almost entirely owned by Nintendo save for everything relating to Banjo and Conker, thereby allowing the game to be re-released (alongside Microsoft not currently participating in the handheld gaming market). Timber and the others running away from Wizpig. The Kongs agree to help in their fight with Wizpig. When his parents go on vacation, Timber is left to care for the family island, Timber's Island. Unfortunately, an evil pig wizard, named Wizpig, invades the island and brainwashes Tricky, Bluey, Bubbler, and Smokey to be his lieutenants. One of the island's fastest racers, Drumstick, challenges Wizpig to a race, only to disappear without a trace after doing so. In desperation, Timber, along with his friends Tiptup, Pipsy, and Bumper, sends a letter to his friend Diddy Kong via Squawks, asking for help. Accepting Timber's plea, Diddy calls Dixie Kong and Tiny Kong to assist him. Krunch, a Kremling Krew spy, sets off to Timber's Island following the Kongs, attempting to figure out what they are up to and so that King K. Rool can be informed. With help from Taj and T.T., Diddy, Timber and co. manage to beat Tricky, Bluey, Bubbler and Smokey in races and snap them out of Wizpig's brainwashing. Drumstick, who had been turned into a frog by Wizpig, is also returned to normal. After Wizpig's brainwashed minions become defeated, Wizpig is next challenged by Diddy Kong and his friends. After a race, Wizpig is seemingly defeated and a victory celebration is held. Unfortunately, Wizpig crashes the party. Following Wizpig to his home planet, Future Fun Land, Diddy Kong and his friends manage to get past all of Wizpig's challenges and get a rematch with the rocket-riding Wizpig. After another race, Wizpig is beaten and his rocket malfunctions and crashes into a deserted planet and becomes stranded. He also mentions that he shall return sometime. Returning to Timber's Island, another celebration is held, with Wizpig having been beaten for good and his hold on the island gone. Diddy Kong Racing DS features a total of twelve racers, four of which are unlockable. The racers' stats vary in three major categories: speed, acceleration, and handling. 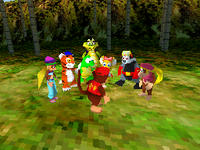 Eight of the racers, Diddy Kong, Tiptup, Pipsy, Bumper, Timber, Krunch, T.T., and Drumstick, are all available as racers in Diddy Kong Racing. 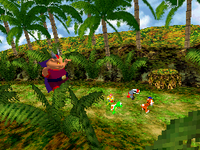 Taj and Wizpig are in the original Diddy Kong Racing, but are not playable characters. Banjo and Conker were replaced with Tiny and Dixie Kong respectively. Drumstick On the map in Adventure Mode, flick a frog onto the cliff with the frog face on it, then run over it. T.T. Winning against T.T. on every track in Time Trial mode. Taj the Genie Completing Adventure Mode. Wizpig Completing Adventure Mode 2. Diddy Kong ★★ ★★★ ★★★ Diddy is a fairly balanced racer, with moderate acceleration and handling. However his speed is slightly below average. He has the same stats as the other Kongs. Dixie Kong ★★ ★★★ ★★★ Diddy's girlfriend, Dixie, shares his stats, with below average speed being her only glaring flaw. She has the same stats as the other Kongs. Tiny Kong ★★ ★★★ ★★★ Dixie's sister, Tiny, shares her stats, with below average speed being her only glaring flaw. She has the same stats as the other Kongs. Tiptup ★ ★★★★★ ★★★★★ While Tiptup lacks speed, he has great acceleration and handling. He has the same stats as Pipsy. Pipsy ★ ★★★★★ ★★★★★ Although Pipsy's top speed is far below average, she doesn't have any problem reaching it with her high acceleration, and great handling skills. She has the same stats as Tiptup. Bumper ★★★ ★★ ★★★ Bumper has average speed and handling, and slightly below average acceleration. Timber ★★★ ★★★ ★★★ Timber is a well balanced racer with all three stats being in the middle. Krunch ★★★★ ★★ ★★ Krunch's top speed is above average, but his poor acceleration and handling could be a problem to unsuspecting players. T.T. ★★★★★ ★★★★★ ★★★★ T.T. 's stats are off the charts, with above average handling being his worst stat. Drumstick ★★★★ ★★★★★ ★★ Drumstick's got great speed and acceleration, but his tricky handling could require some getting used to. Taj ★★★★★ ★ ★ Taj's great top speed is a trade off for low acceleration and handling. He has the same stats as Wizpig. Wizpig ★★★★★ ★ ★ Wizpig has nice top speed and shares the stats with Taj, but his acceleration and handling leave a lot to be desired. 8 Custom A & Custom B Both are 100 Major speed improvement and a great custom look. Handling is sacrificed and is shrunk down to poor stats. 5 Coin Challenge & Coin Challenge Mirror 20 Major part of the Nintendo 64 version, racers race through all the tracks, having to collect eight Silver Coins, and it is required to come in first place to win the challenge. 8 Battle Track 2 (Icicle Pyramid) 30 One of the original Battle areas in the Nintendo 64 version, racers tries to strike down their rivals in a huge ice temple. If the racer loses all their bananas they lose. One of the original Battle areas in the Nintendo 64 version, racers try to strike down their rivals in a big dark water lake with small sand island-like platforms. The objective to win is similar to Icicle Pyramid. If the racer loses all their bananas, they lose. 10 Battle Track 4 (Smokey Castle) 30 One of the original Battle areas in the Nintendo 64 version. The objective to win is similar to Fire Mountain. The racer has to fill their chest with Taj Tokens. First gaining ten tokens wins. 11 Billboard Editor 50 The player can fill the racetracks and courses with their own artwork. 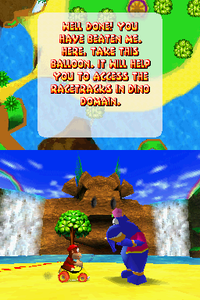 Colored balloons await the racers in normal racing levels. They consist of weapons. Once a player gets up to three, they increase in strength. Power-Up Tokens are also scattered in every single race track. The player must collect one and can upgrade their balloon strength with just one balloon and set it to maximum power. The car is the most basic vehicle with four wheels and a seat. It has simplest handling, but it can only stay on the ground, being slowed down slightly when driving off road, and goes extremely slow when used in the water. It is limited to only use zippers on the ground. The car is a beginners vehicle. It can be used in eighteen out of twenty four race tracks. In Adventure Mode, it is used the most, being used on twelve of the tracks. It is used against Tricky and Wizpig, during their first matches. The plane is slightly trickier to control than the car. However, the plane isn't restricted to having to use the road, which enables it to cut corners inaccessible to cars such as the pathway to Snowflake Mountain. 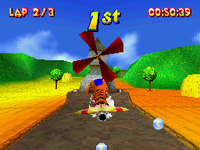 There are also many tracks which have paths only usable by the plane, many of which are slightly harder to access with some sort of reward, such as a balloon or a Power-up Token. The plane is not restricted to any zipper, being the only vehicle able to use all three types, and the only vehicle which can use airborne zippers. It can be used in fifteen out of twenty four race tracks. In Adventure Mode, it is used in five races, and against Smokey and Wizpig in his second race. The hovercraft is possibly the trickiest to control. However, it isn't hindered by driving off road or in water, although it can skid on roads. Its ability to drive over water enables it to use shortcuts on some tracks. The boat can use zippers on the ground, or in the water, making it more versatile than the car, but less versatile than the plane. It can be used in all twenty-four race tracks. Despite this, in Adventure Mode it is only used on the three tracks being Whale Bay, Pirate Lagoon, and Boulder Canyon. It is used against Bluey and Bubbler when raced against. The three Zippers variants, for Car, Plane, and Hovercraft. Zippers help vehicles Turbo Boost around corners on race tracks. They have red and yellow stripes and stand out from whatever track the racer is playing. By letting go of the gas while driving over/through a zipper, the racer can get an even larger boost. The Car Zipper is flat on the ground and is fairly simple to get a good boost from and is chevron-shaped. The Plane Zipper is found in the air and is a circle shape. The plane is the only vehicle that can access it. If racers attempts to get the boost at an angle, the boost lags and becomes a big time consumer. The Hovercraft Zipper is found in water and is a triangle shape vertex that allows easy boosting and weapon advantage strategy making. Planes can also use it. It has been requested that additional images be uploaded for this section. Remove this only when the image(s) have been uploaded for this section. Diddy Kong Racing DS contains twenty-four race tracks split between six cups. In most races (marked with a check mark), racers are able to choose what type of vehicle to bring into the race, which can effect the paths in the course they are able to take. For some races, there are vehicles that are not able to be taken into it (marked with a red X). Abbreviations in bold denote the vehicle required to be used when racing in Adventure Mode. Taj, after his respectable defeat. Taj races and trains the racer in many areas aside from selling the player unlockables and helping them customize their car. He usually rides his magic carpet or stands in awe as the racer fulfills Taj's own wish. In return for the racers success in the challenge he gives them a Golden Balloon. Car Race - Once the racer starts their game, they race Taj around in a circle with the car, following the black and white tokens. This is an act of training and racers receive their first Golden Balloon. Hovercraft Race - Before the racer goes to beat Tricky again, Taj races the racer with the hovercraft around the island while following the tokens. Plane Race - After Dino Domain is completed, the racer races Taj in planes around the island following the tokens in a similar pattern to the Hovercraft race. Blowing out the Torches challenge - After Bubbler is defeated, Taj orders the racer to blow out nine torches on the island in sixty seconds or a single minute. Taj Token Tussle - The racer races Taj around the island for ten Taj Tokens by following the arrows to their temporary locations. The first to ten tokens wins. The results screen after completing a Balloon Touch Challenge. After the area's major boss is defeated (except Future Fun Land's), the boss orders the racer to get at least a Bronze Balloon in each of their four tracks. 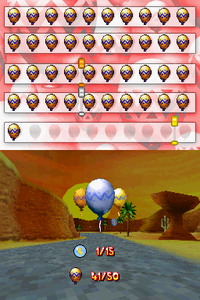 By using the Stylus, racers can pop the Golden Balloons scattered over each track. Fifty Gold Balloons are in each, and after popping them can gain the rank Bronze, Silver, or Gold. Once the racer gets the bronze ranking or higher, the racer receives a Golden Balloon for their first win at the challenge and unlocked the Silver Coin Challenge for that world. Diddy Races in a Trophy Race in Windmill Plains. Trophy Races are Grand-Prix races where racers race each other in the area's four tracks in order, in an attempt to win the most amount of points. The racer must jostle with the computer racers' places in the races, which vary in each track, so winning one or two races secures the racer a gold trophy. Each Trophy varies in appearance to the area it's associated to. By winning trophies the sign by the lighthouse near Sherbet Island fills up Wizpig's face. Once all four Wizpig Amulets are accounted for, the racer can blast to Future Fun Land after they defeat Wizpig in his first race. The fifth and final trophy race must be completed before Wizpig can be defeated, this is the only time a trophy race must be completed before the boss is defeated. Single race allows two, four, or six racers to compete in one track at a time. 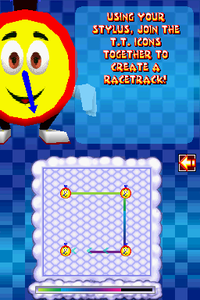 A track is selected by each racer, and a randomizer randomizes the vehicle and track the racers use and play on. Then to the left of their usernames is a colored circle, which indicates their mark on the track. Their character icon is kept hidden from online activity. Trophy Races of the four main areas are available and a trophy Race of Jungle Japes with the four new tracks. In a Grand Prix styled event, the racers race through the four tracks in sequence, and whoever gains most points wins. When battled at least once, a Battle Track is unlocked, two-four racers can battle on the four tracks of the original Nintendo 64 version. If at least two Diddy Kong Racing DS games are owned, the racers can race with every Multiplayer option available. Their icons are also visible. The entire basis is based on the racer who owns the game and the other racers who do not own the game must do whatever the one with the game wants. Options aren't limited, but the paint of the racer's vehicle is set to the default color of yellow and so are the gameless racers. Also, the icons aren't visible. 1 Banjo and Conker are among the selectable characters. Due to Nintendo losing the licensing for these characters (and also that Conker would no longer fit in with the game's theme), Dixie and Tiny replaced them. 2 Taj has a face plate in the center grove of the island where a racer can honk a horn and summon him. Taj now owns a tent and is summoned by honking or tapping it with the stylus. 3 Bananas are a source of speed. Collecting ten total achieves maximum speed, and getting hit by a weapon makes the racer lose two bananas. Rare Coins replace the bananas and they can be collected to purchase unlockable content from Taj's tent. 4 Wizpig and Taj are non-playable major characters. Wizpig and Taj are playable once unlocked. 5 Tricky's track is a spiraled mountain with a shortcut near the middle. It's easy to fail the race by falling off. Tricky's Track is shorter and falling off is not as easy. 6 Tricky's second boss round has falling trees. Tricky's second boss round has no falling trees. 7 Cutscenes are elaborate and each character has unique voices and music. The cutscenes are less impressive and simpler, and the characters have changed voices so that they sound almost alike (except for T.T. 's which sounds identical to the Nintendo 64's release). 8 After a boss is defeated two times, Taj's face replaces Wizpig's on the boss door. Once the boss is beaten, the door does not change. There is also a third challenge that uses the Touch Screen. 9 T.T. has great speed and acceleration, and an above average handling. T.T. has great speed and handling, and an above average acceleration. 10 Four random prize balloons float in certain parts of the island for the racer to fly into and collect easily. The four balloons are now at a price: each has a little touch challenge for the racer to fulfill to get the balloons. 11 There are four battle stations after the player gets a hidden key in one of the four tracks in the world and if the racer wins the battle stages, they get a balloon from Taj and a piece of the T.T. Amulet. The player may receive a part of the T.T. Amulet by racing in a Wish Race, three of which have preset designs. The battle stations are now only available in multiplayer mode. 12 Planes can barrel roll and flip. Barrel rolls and flips are absent. 13 Krunch has a skull on the back on his jacket. Due to the limited graphical resolution, the skull is no longer drawn. 14 Magic Codes are a part of the game. There are no longer any Magic Codes. 15 Walrus Cove has ice that makes a racer bounce back on the track. Ice is replaced with water. 16 Everfrost Peak can have the racers in cars. Cars are a removed choice on this track as the ice has changed to water. 17 If the player loses a race, a frame encloses the camera and gives them an option to retry, return to the lobby, or quit. If the player loses a race, Wizpig appears and laughs at them, and they are immediately sent to the world's lobby. The skybox also has Wizpig with both hands up, and this scene won't be shown if the player already beat the level. 18 Sometimes a boss gives players a head start. Only Bluey in both races and his extra challenge, Tricky in his first race, and Smokey in his extra challenge, give head starts. 19 Bubbler shoots bubbles in his second race. Bubbler shoots bubbles and spike bombs in his second race, making it more challenging for a racer. 20 Smokey leaves few fireballs in his first race and many in his second. Smokey has an easier second race with fewer fireballs. The first race has none at all. 21 Two Red Balloons make a homing missile and three make ten missiles. Two Red Balloons make five Semi-Homing Missiles while three make a Homing Missile. 22 Yellow balloons with purple stars have three icons that indicate their power shield in this order : a red and yellow circle, a star, and a lightning bolt. The first and last icons are reversed. 23 A voice says "Diddy Kong Racing! Press start." on the title screen. The voice is not heard on the title screen. 24 Taj has a stereotypical East Indian accent. Taj has a softer, British-Indian accent. 25 After beating the boss the first time, the player has to complete the Silver Coin Challenge. After beating the boss for the first time, the player has to complete the touchscreen Balloon Popping Challenge. Once done, the Silver Coin Challenge is unlocked for Time Trial Mode for each track completed. 26 Diddy Kong has no eyelids. Diddy Kong has brown eyelids (like in Donkey Kong 64). T.T. instructs the player to create a Wish Race. T.T. has a slightly more notable role, and is the other host aside from Taj. T.T. hosts a Wish Race challenge from behind a Wish Door in each world, which he is locked behind. The player must collect a Wish Key, hidden in a course of each world, to access this challenge. In it, T.T. instructs them to draw a racetrack with their stylus, known as a Wish Race. These replace the Battle Stages from the original Diddy Kong Racing, which were redone as multiplayer battle stages. The player must win against T.T. to free him and recover a piece of the T.T. Amulet. He also walks around the lobby after being freed. Ancient Lake - A bit less heavy metal and a bit more jungle-like. Jungle Falls - A new score with its name sung into it "Jungggggle, a-jungle falls". The music from the N64 Jungle Falls is now used for the credits. Hot Top Volcano - The refrain is slightly less danger-type and slightly more ground-pounding. Snowball Valley - Instead of sharing its music with Everfrost Peak, the DS version has more jolly music. Pirate Lagoon - A more tropical background tone than the hip pirate-like music in the original. Treasure Caves - Less ground-pounding than the original's music, and a more tropical feel. Windmill Plains - Instead of sharing its music with Greenwood Village, the DS version has more country-style music. Darkmoon Caverns - A pinch less of a danger-type music and a pinch more space-type. Spaceport Alpha - More space-type music quality. Spacedust Alley - Has the old Spaceport Alpha music. In the original, it shared its music with Star City. Nintendo DS Aaron Thomas, GameSpot 6.7/10 "At its core, Diddy Kong Racing DS isn't a bad kart-racing game, but its best feature, the racing, is buried underneath so much unnecessary garbage that some people will find it nearly impossible to enjoy. Had Rare stripped the island setting, toned down the tedious collecting, and tweaked some other minor issues, the game would have been better with less. Instead, it chose to add more and more content, and the game suffers for it. Some of the new additions, such as online multiplayer and the various customization features, make the game more enjoyable, but many of them, particularly the touch-screen controls, make it worse. If you don't mind that the game sometimes feels more like Donkey Kong 64 than a racing game, then you'll probably enjoy all that Diddy Kong Racing DS has to offer. But if you just want to race, there are better options." Nintendo DS Keza MacDonald, Eurogamer 5/10 "Despite remaining, after ten years, the only 'adventure racer' that I can remember appearing on a Nintendo console, Diddy Kong Racing still manages to feel unoriginal. Insipid character and course design married with inherently repetitive gameplay, obsessive collecting and an array of horrible touchscreen features make this feel like a waste of time. It's got plenty of content, and is a perfectly serviceable, occasionally competitive kart racer, but there's not much distinguishing about it. Ten years ago, I rather enjoyed this, but in retrospect, it probably belongs back in 1997." Nintendo DS Craig Harris, IGN 7.1/10 "Diddy Kong Racing had huge competition back when the original game hit the Nintendo 64 as Mario Kart 64 was the king of the track on that platform. Ten years later, history repeats itself: Mario Kart DS is a tough nut to crack, but Diddy Kong Racing manages to offer up a significantly different product that, admittedly, doesn't come close to the same satisfying experience as Nintendo's own racer. The racing's fun and challenging, no question. The ability to zoom around in cars, planes, and watercraft is reason enough to give this one a go on the Nintendo DS. But unfortunately the development team focused a bit too much on "DS-izing" the product with completely unnecessary and frustrating touch-screen and microphone challenges that disrupt the racing design. Some DS elements are better than others, but the ones that are bad are huge problems that should have been axed to make room for the elements that actually worked. Overall, Diddy Kong Racing's a good product with some first-generation blues dragging it down. The fantastic online and customization focus offset some of the clunky items that made it into the design...but don't think we're going to turn a blind eye to the stupid stuff." For this subject's image gallery, see Gallery:Diddy Kong Racing DS. Donkey Kong Country - The tracks Thunder Cove, Meandering Mount, Splashdown Pass and Strangled Shrine seem to be based off the jungle levels in this game. Donkey Kong Country 2: Diddy's Kong Quest - Inside of Boulder Canyon, the castle music from K. Rool's Keep plays. Diddy Kong Racing - It is simply a remake of this game. Donkey Kong 64 - The game's title logo is similar to Donkey Kong 64's. Tiny Kong makes a reappearance. Wario: Master of Disguise • WarioWare: D.I.Y. • WarioWare: Touched! Ball • Bird & Beans • Chef • Donkey Kong Jr. • Dr. Mario Express • Flagman • Helmet • Judge • Manhole • Mario Calculator • Mario Clock • Mario vs. Donkey Kong: Minis March Again! • Mario's Cement Factory • Paper Airplane Chase • Vermin • WarioWare: Snapped! This page was last edited on April 9, 2019, at 21:25.